Each year, the Junior League of Washington hosts a series of community roundtables, convening thought-leaders and stakeholders in the nonprofit, civic, and commercial community to discuss new and innovative ways to address Washington, DC’s most urgent needs. Originally called the Literacy Advisory Board, our first roundtables were organized in 2006 to seek recommendations on how to strengthen the League’s relationship with community organizations and make a positive and lasting impact on literacy in the DC area. 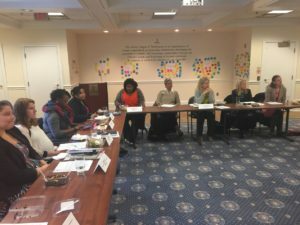 In more recent years, JLW has convened multiple roundtables that focused on specific literacy areas, such as nutrition, health, and geographic literacy. Building upon the productive, meaningful dialogue that has taken place at these roundtables, JLW has expanded the focus to include other critical education needs in the community. Since 2015, we have held multiple roundtable events with our community partners and other stakeholders to collaborate on specific areas of education in the greater Washington community. Please check back for more information on upcoming community roundtables. JLW welcomes suggestions from the community about potential partners and advisors as we continue our efforts to make a positive and lasting impact on these issues. If you have ideas for roundtable topics or want to be included in future roundtable discussions, please email roundtable@jlw.org.